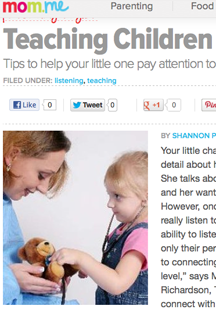 Your little chatty Cathy probably shares every detail about her day with you on a regular basis. She talks about her friends, her toys, her wishes and her wants with excitement and enthusiasm. However, once the chatter stops, does she really listen to you and others? “Developing the ability to listen allows a child to learn not to see only their perspective on things, and to be open to connecting to others on a more intimate level,” says Melody Brooke, a family therapist in Richardson, Texas. Before children can really connect with others, it’s important that they are taught the skills to be good listeners – at home, at school and in social settings.